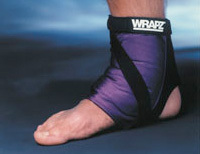 The Ankle WRAPZ is a very versatile product. Ankle sprains, strains, Achilles tendon or any foot problem can be relieved with any therapy your medical professional might recommend for the area. Simply place the center of the pouch on the affected area and relief is on the way. A sprain on the front, lateral or back (Achilles) will be able to be dealt with in an effective and high performance manner. Problems with the top or bottom of the foot can also be cared for with the Ankle WRAPZ.